Haleakala Shores is a peaceful resort with many permanent residents who take great pride in their complex. The atmosphere is quiet and the pool is a beautiful place to relax. Ours is a beautifully spacious condo that can accommodate up to 6 people - with 2 full bedrooms and 2 full bathrooms with all the appliances and amenities of a home away from home. 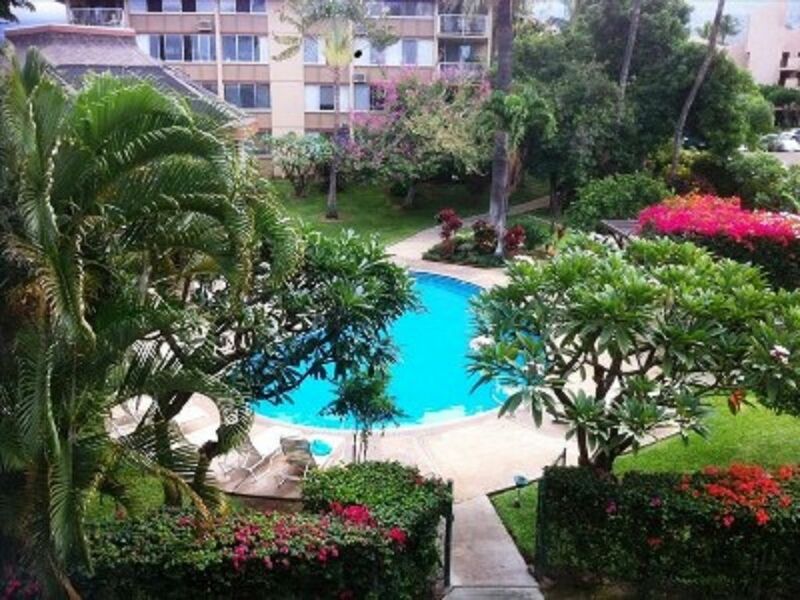 This suite is located on the 'quiet' side of the complex with 1200 square feet of attractive, comfortably furnished living space, a great kitchen and entertaining area, lovely living room and private lanai. There is comfortable dining at the table or on stools at the breakfast bar. The master bedroom has a California King Suite with new mattress, fine bedding and a private lanai accessed by both the bedroom and living room. Shoji-style doors give you the option of complete privacy for the second bedroom with 2 new daybeds or they can be opened for greater living space. There is a ceiling fan and several very efficient portable fans. Both bathrooms and the kitchen have louvered windows that offer a refreshing breeze throughout the day. The living area has a new sofa set that converts to a queen bed and a comfy LazyBoy chair. We have a 32 inch flat screen TV, DVD player, free WiFi, CD player and IPOD speakers/docking station. The lanai is lit for evening use and seats 4 for dining with a lounge chair for relaxing. Swim and lounge at the beautiful pool, surrounded by lush landscaping and great BBQ areas - perfect for any size gathering. A 2 minute stroll brings you to the golden sands of Kamaole III for swimming and tremendous snorkeling opportunities. This is known as one of the best beaches on the island boasting fabulous sunsets and great picnic spots. There are shaded grassy areas, fresh water showers and lifeguards. The heart of Kihei is within walking distance with local artisans, farmer's markets, great dining and entertainment. The building and condo are wheelchair accessible with limitations. Beach towels, beach chairs, assorted snorkel equipment, grass mats, umbrella and ice chests/coolers are provided. Our condo features a covered and cool designated parking space and an elevator for easy access. Great kitchen with fine appliances. All the amenities to make any cook feel at home. The patio around the pool provides plenty of shaded areas to relax and great lounging in the sun. Most wheelchair users would easily access the condo, bathrooms and open living space but there are no extra accessible features. We loved our stay at Haleakala Shores. The condominium had everything we needed (well stocked kitchen), laundry machines, etc., and it was much closer to the beach than we expected! Ashley was incredibly helpful and always responded very quickly to any questions we had. Highly recommend this place for a stay, we will definitely be coming back! Great location, comfortable for a small family (2 adults and 2 kids). Very close to the beach and restaurants. Those who are interested to cook, Kitchen has more or less what you need. The apartment is very clean, spacious and located in the good neighborhood. Washer and Dryer is definitely a plus. Response from Ashley was great until booking. After we checked in and had one request, no reply from her, not sure if she was busy. This property has no Air conditioning (which I was aware of before making the reservation), please check weather conditions before booking this property as table fans in the apartment don't really help if the temperatures are high. Ceiling fan in the dining area definitely requires replacement. This condo definitely is spacious and bright! We enjoyed having the two separate bedrooms with their own bathrooms. It was clean, taken care of and supplied with plenty of kitchen items as well as bath and beach towels and any other items you will need at the beach. We loved sitting outside on the balcony at the table for dinners. Kam 3 beach is a very short walk across the street with Kam 2 not too far away. Shopping and cinnamon rolls are also a short walk away from the condo. Ashley is very pleasant and easy to work with! She made what could have been a very stressful last day extremely enjoyable! The price and location (off of S Kihei Rd) are unbeatable. Highly recommend! We enjoyed our stay at Haleakala Shores B-306 in May. The complex was very quiet, and well maintained. The condo was very large, and provided plenty of room for our 11 day trip. It had everything we needed to enjoy the beach (closet full of beach gear), and many large beach towels. Kitchen was well stocked with blender, toaster, 2 coffee makers, etc. Unit had not been totally remodeled recently, but was well taken care of and met all of our needs. We will definitely stay here again on a future trip. For a large 2 bedroom, 2 bathroom unit this close to the ocean, it was a great value. Thank you Ashley for the use of your Maui condo. This condo is very clean, spacious and comfortable. Quiet complex with many full-time residents so not a party place, which we loved. Great location. The beds were very comfortable. If you get the twin next to the big window...lucky you...you can stargaze from bed! This is not a luxury condo but it has all the comforts of home. There is a Keurig coffee maker and a regular one, so you can choose how to brew. There is no air conditioner, but a very large lanai and lots of fans and windows so the trade winds keep it very comfortable. There is wear and tear on some of the doors and one of the bathroom doors needs to be replaced because it is splintering and could injure someone. Some people may prefer a more modern, updated condo but I think it is great the way it is, and a great value! The owner/manager is very responsive. We will be staying here on future trips. Thank you Jan and Ashley for sharing your lovely home. We had a great vacation!! Mahalo!! This little gem is a short walk to the beach, and the pool/barbecue/garden area is lovely and peaceful. The condo itself was a good size for our family of four adults, and everything we needed for our stay was provided. Correspondence with the owners was prompt and professional. Thank you!